Support for 56 languages in the world, 20 kinds of languages voice input. The software supports multi-lingual, Translation speed, The file size small. - Application supports a total of 56 languages around the world, Support for 20 languages? voice to voice translation . - The translation speed of the program more than 30% faster than similar application, The file size is only 5M. 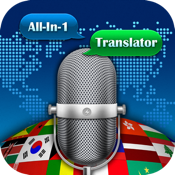 - Fast real-time translation, Voice support for 20 languages voice translator. - Fast text translator supports 56 languages, And support for voice input and text reading. And text can be completed full-screen display. - Open the page you want translated, Select the translated text, Click the " Translate" button, The target text will immediately be translated into the language you want. - For the important text translations, You can add the Star logo, And save it to the star page. This can be easily read at anytime. - You can depending on your translation needs quickly switch "the voice translation", "text translation", "web page translation"'s source and target languages. English, Chinese, Japanese, Arabic, Polish, German, Russian, French, Korean, Dutch, Czech, Malay, Afrikaner, Portuguese, Turkish, Hebrew, Spanish, Italian, Indonesian. Download and use this application, You 'll be able to enjoy convenient translation services.